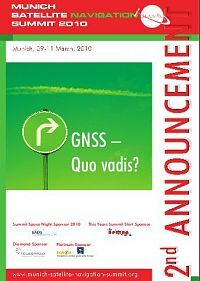 Munich Satellite Navigation Summit 2010 | Space Agenda, The space related events calendar! and other exciting worldwide activities in the receiver field and service creation. Various sessions will feature discussions among invited panellists talking about perspectives and critical issues in various rapidly growing application scenes of satellite navigation, in particular with Galileo. Brief presentations and statements of the panellists are initiating each session. An interactive question and answer period with the auditorium is closing the topic. 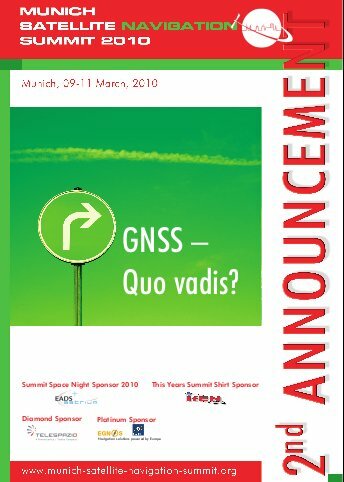 Emphasizing a future trend in satellite navigation, this year’s Summit will focus on special sessions on safety and security, in particular also on the use of the Galileo Public Regulated Service (PRS). An exhibition for industry and institutions is taking place during the conference. The Galileo Master competition will be opened. The Summit is part of the efforts of the Bavarian government and the cluster on aerospace and satellite navigation to stimulate applications and services in this high-tech field in the greater area around Munich.